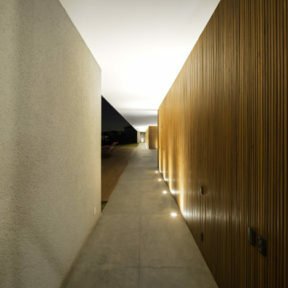 From the architect Studio MK27. 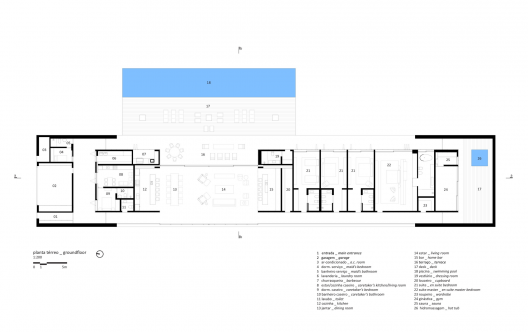 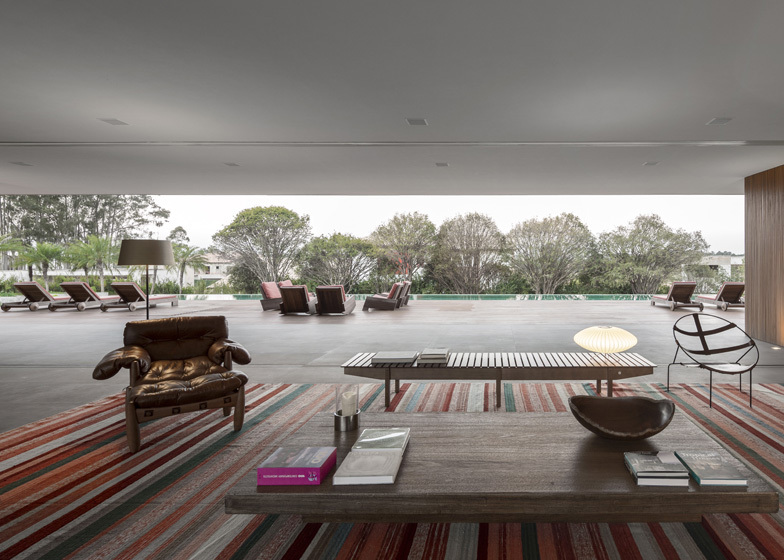 The spatial continuity with the living room is larger: all of the windows are recessed creating an extension of the external space, with a large veranda. 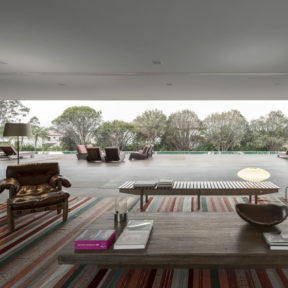 The living room then prolongs the pool deck and crosses to the other side of the lot. 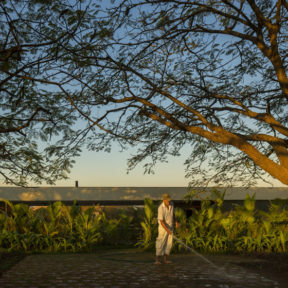 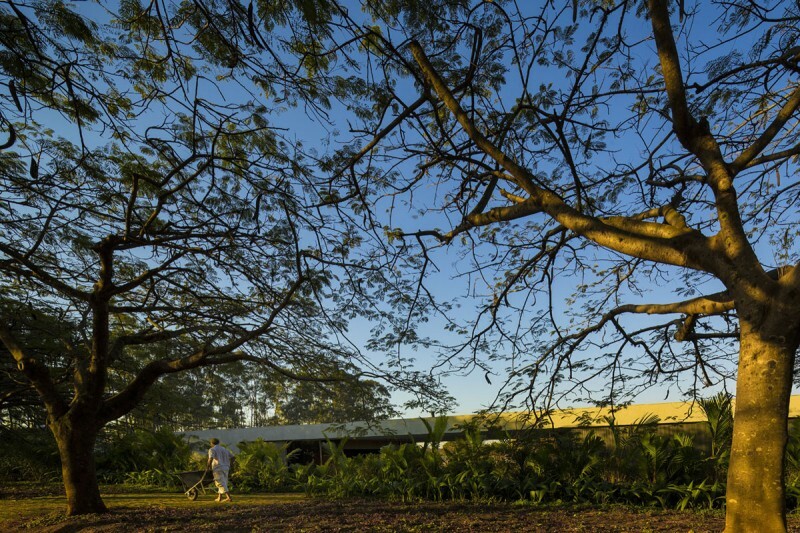 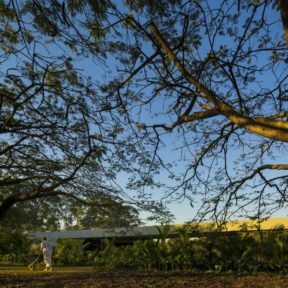 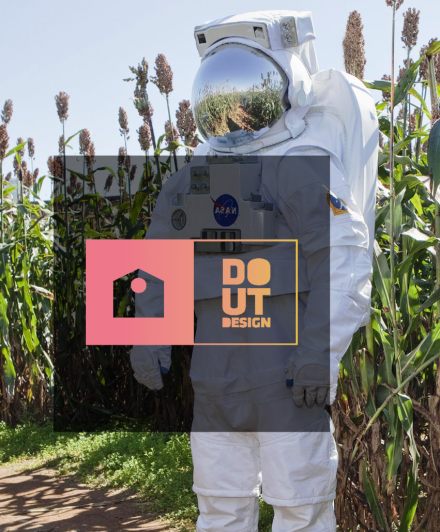 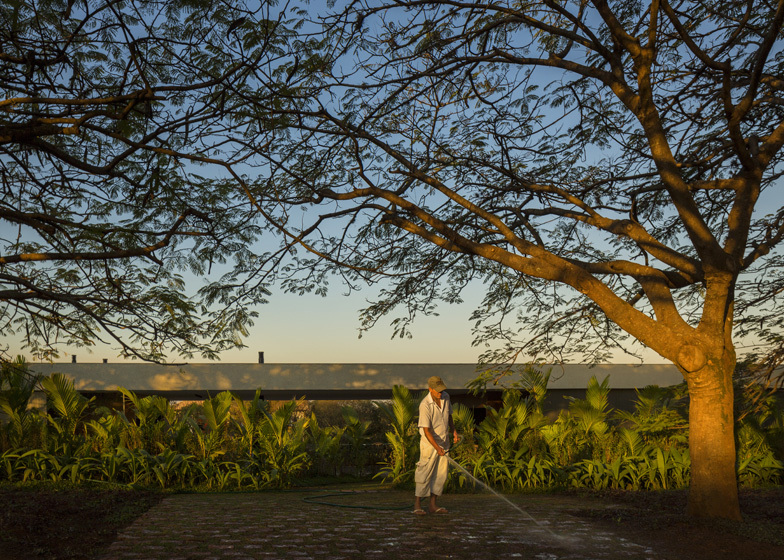 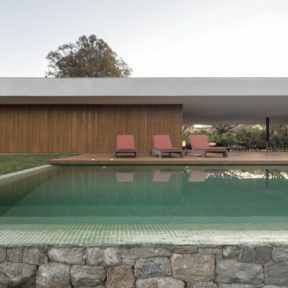 These solutions are fit for the climate, the interior of the State of São Paulo, in the Brazilian southeast, which has elevated temperatures almost every day of the year. 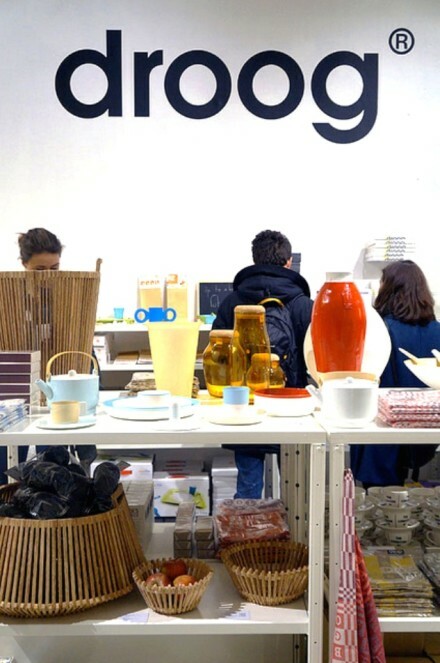 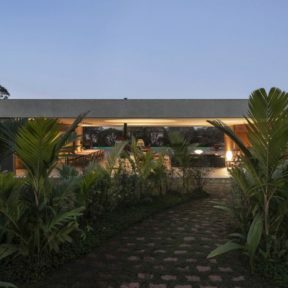 Strategies of traditional ambiental comfort of vernacular architecture and even Brazilian modern was used. The living room has cross-ventilation, which greatly lowers the internal temperature and the other rooms are protected by wooden muxarabis panels placed on sliding doors which filter the Sun without removing the ventilation. 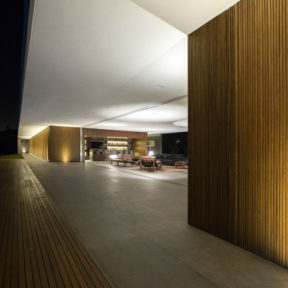 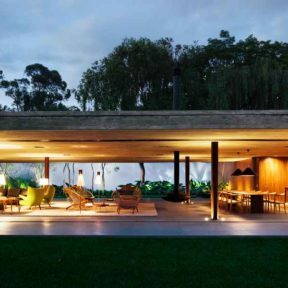 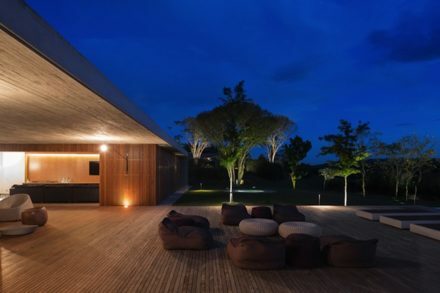 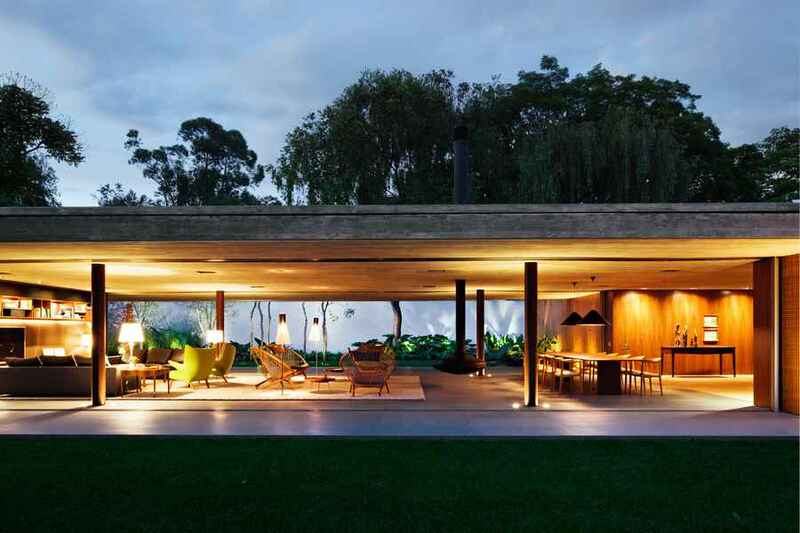 The front veranda is delimited by a foyer in the façade revealing two wooden boxes divided by the social area. 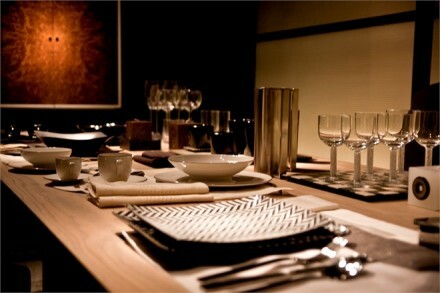 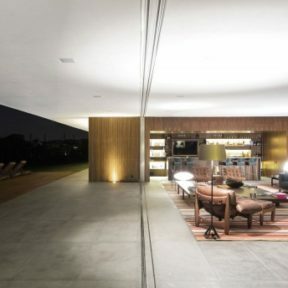 The kitchen opens to the living room, encrusted in one of the boxes that hold the utility areas. 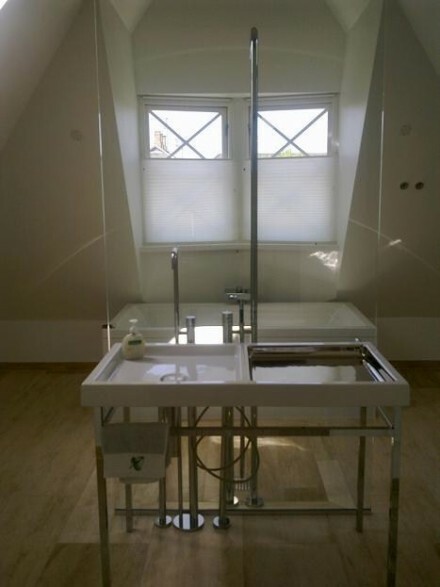 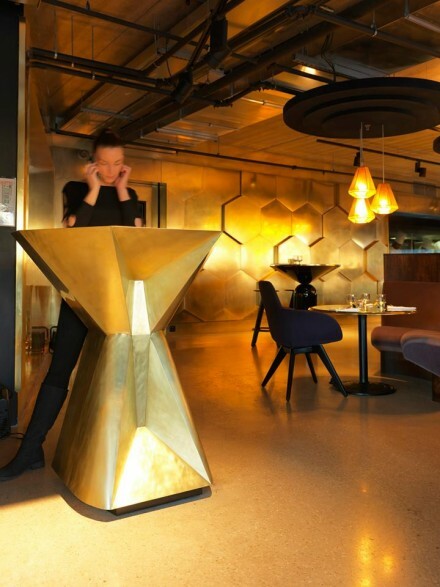 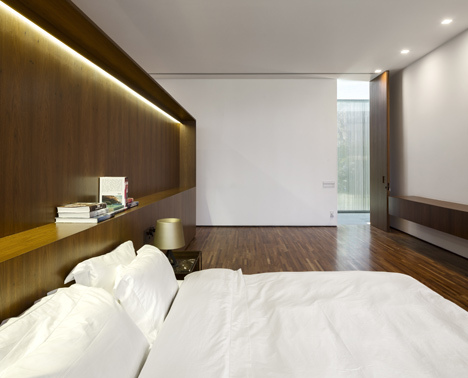 The bar opens out to the social area and is contained in the box that holds the bedroom as well. 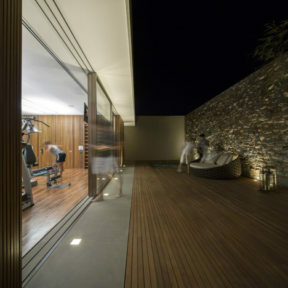 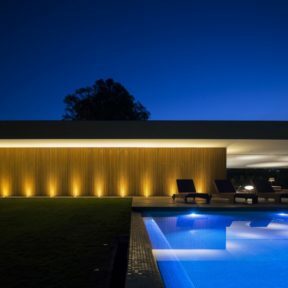 At the end of the corridor of the bedrooms, which can also be accessed from the outside of the house, there is a spa delimited by external walls and composed by a gym room, a sauna and a small outdoor pool encircled by the deck. 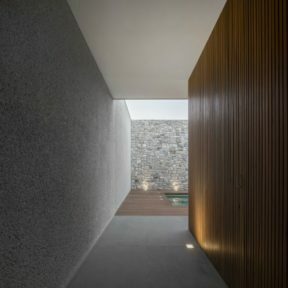 Besides the wood of the wooden boxes, the house is clad by White mortar and the internal patio of the spa is encircled by stones. 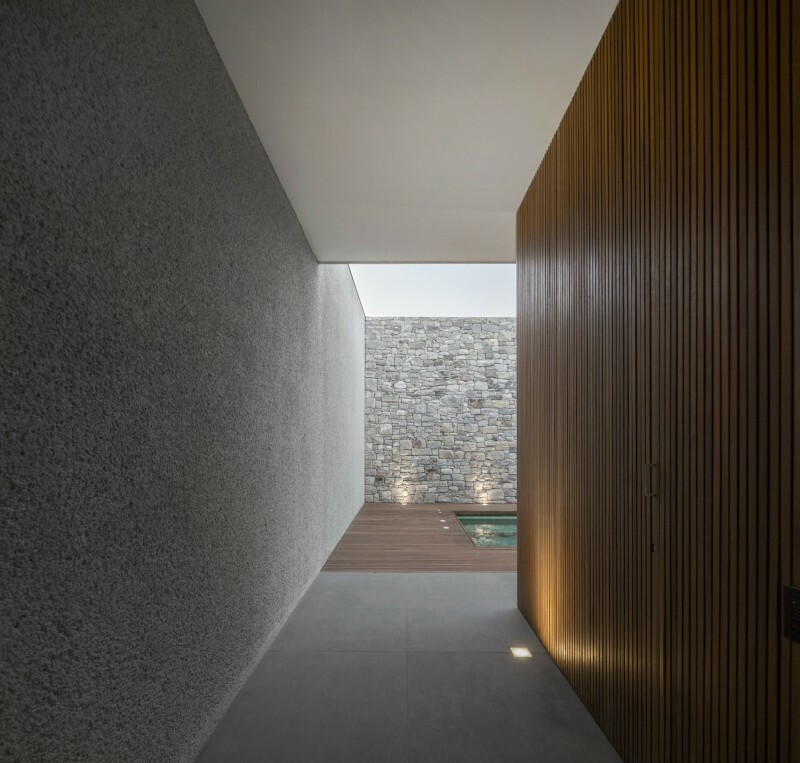 The few materials used by the Lee house and the simple organization of the program create a minimalist atmosphere that extends from the outer to the inner areas of the house. 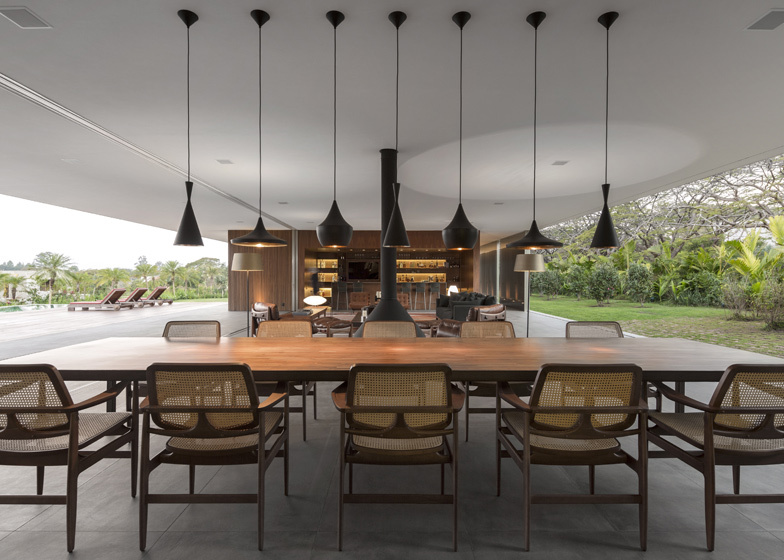 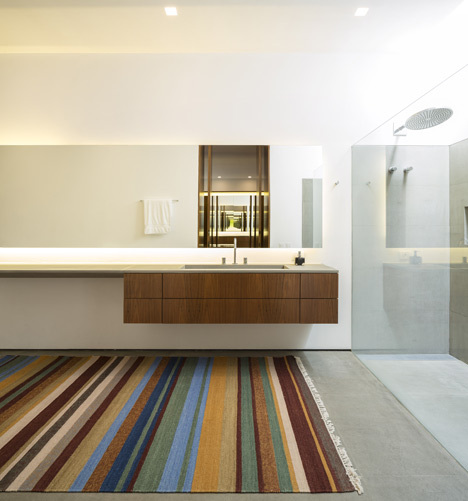 Studio MK27‘s Eduardo Glycerio designed furniture especially for the house and worked alongside interior designer Diana Radomysler to plan the fittings for each of the rooms. 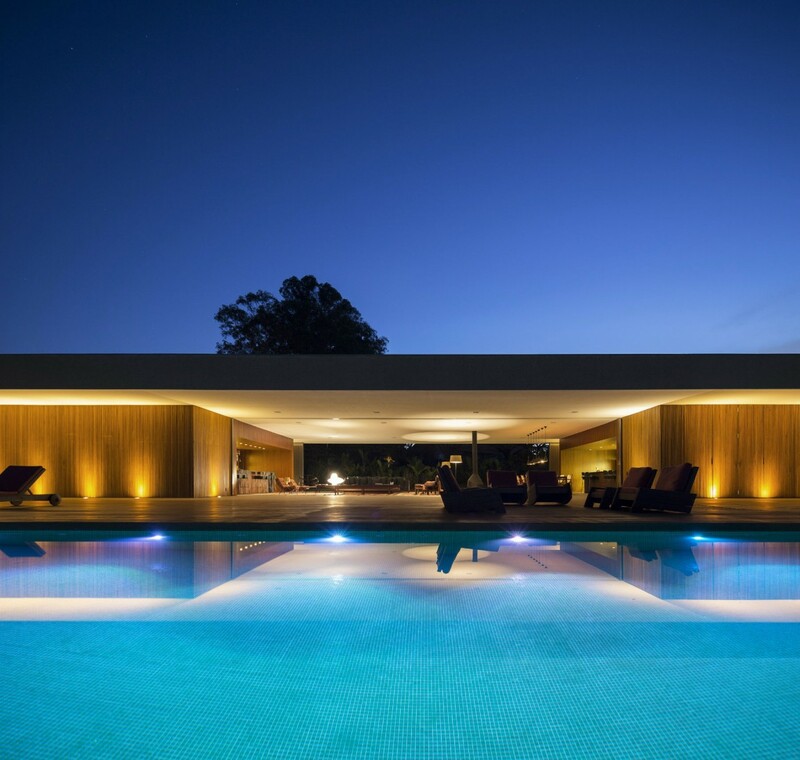 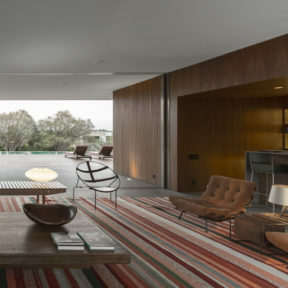 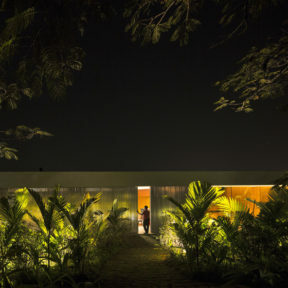 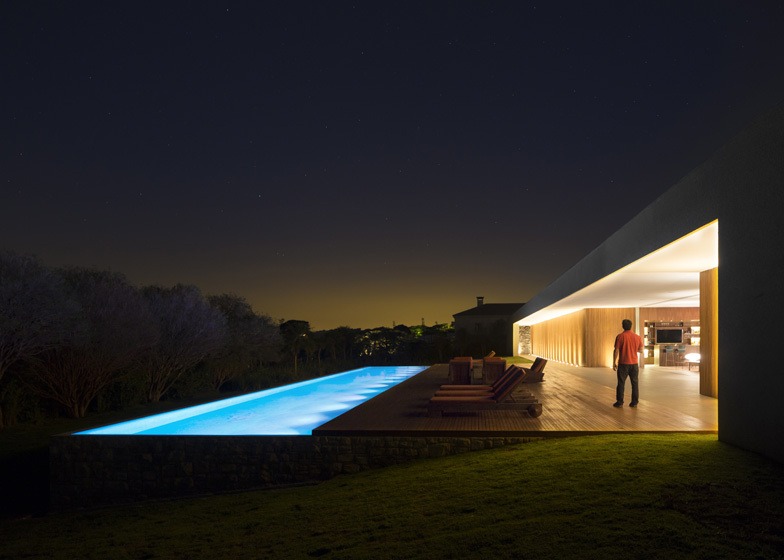 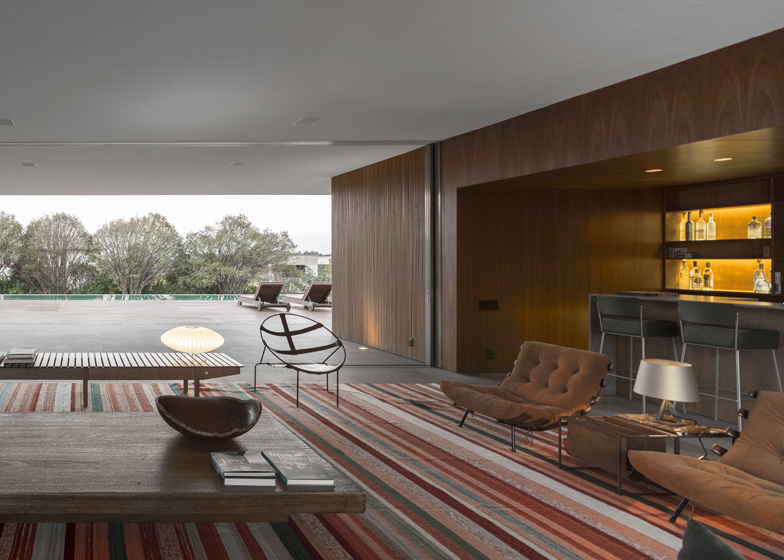 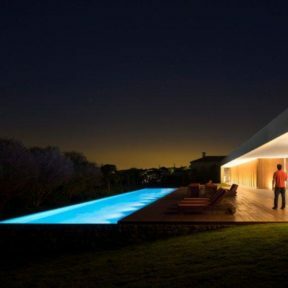 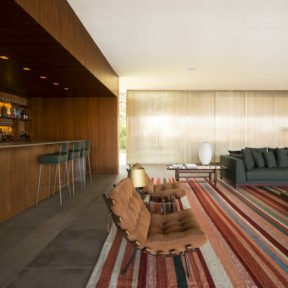 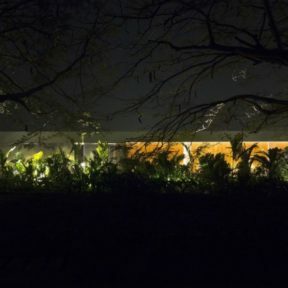 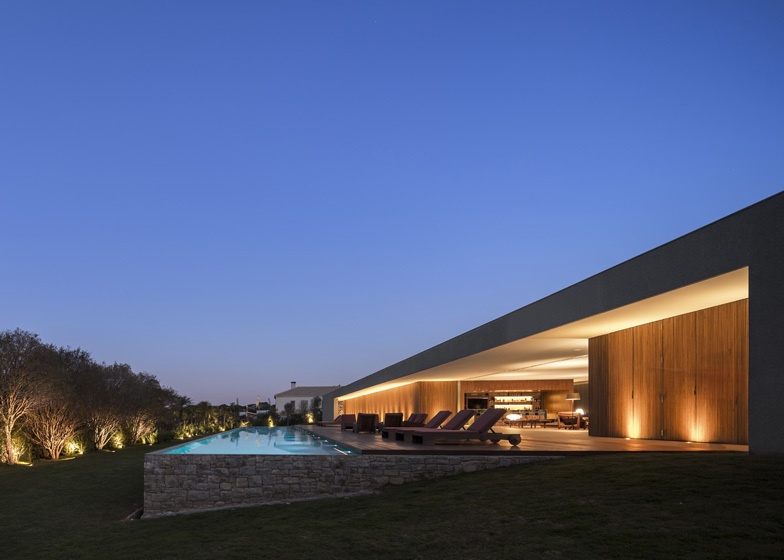 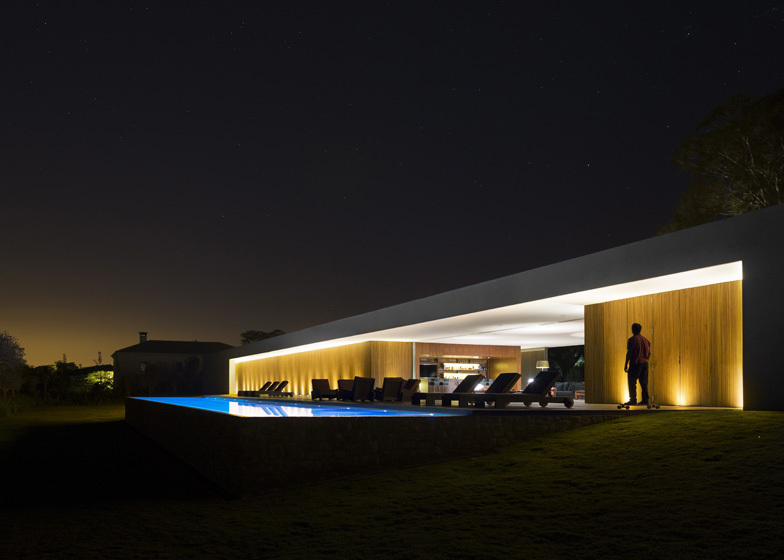 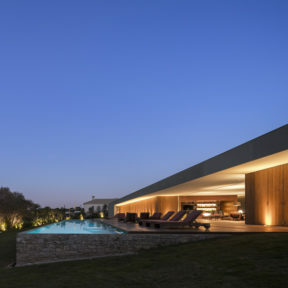 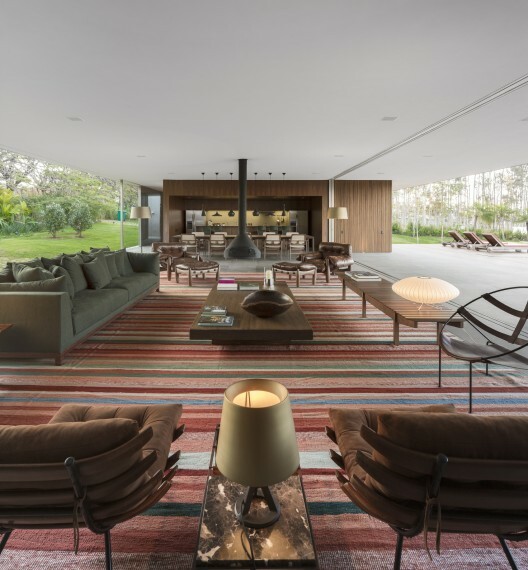 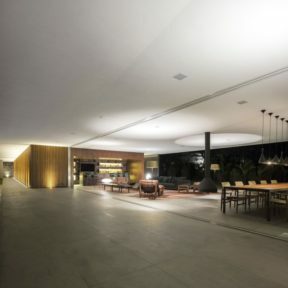 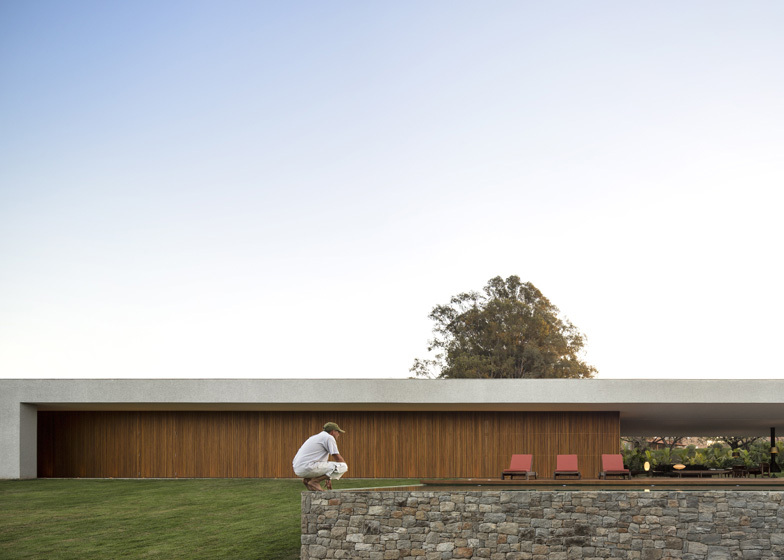 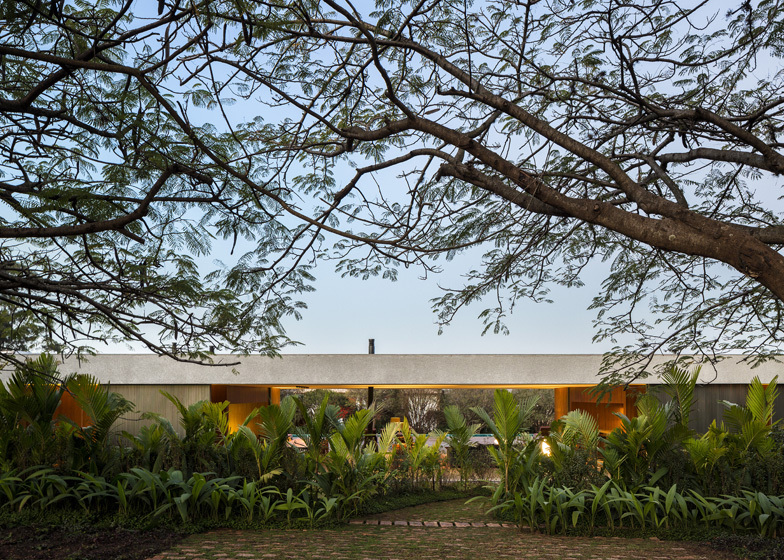 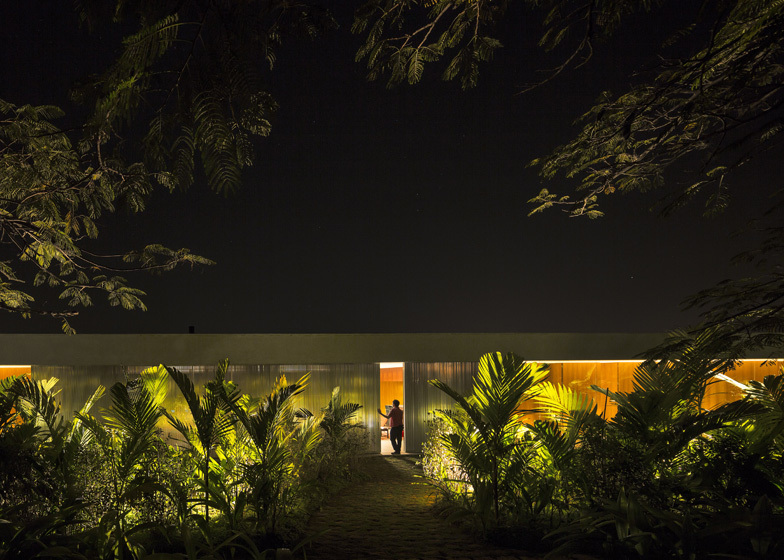 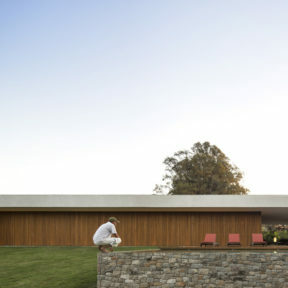 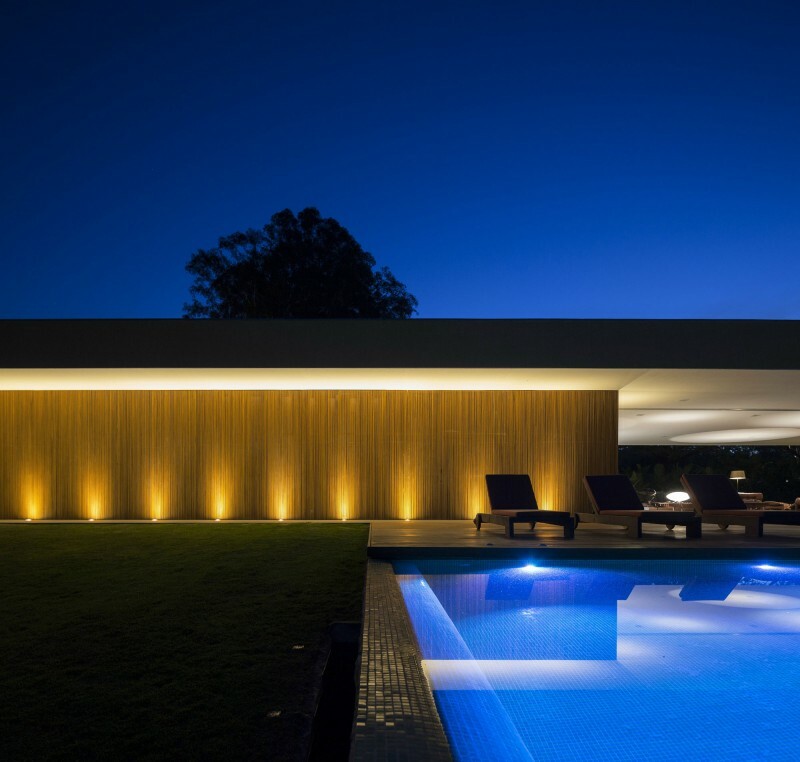 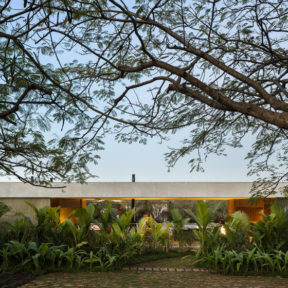 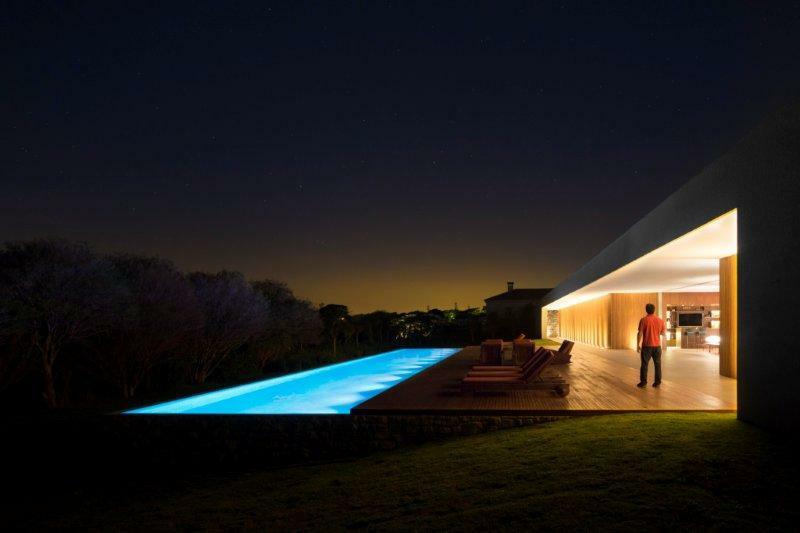 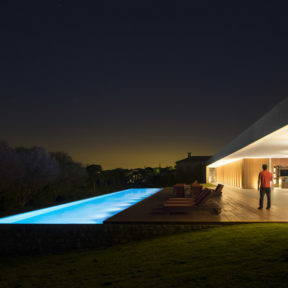 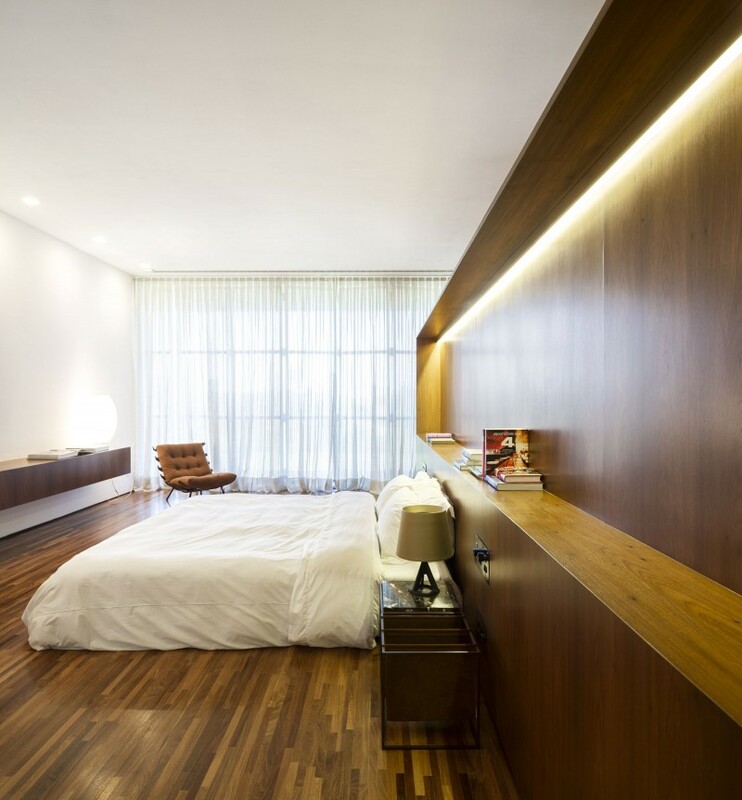 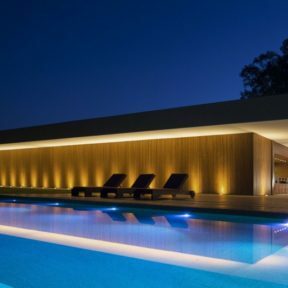 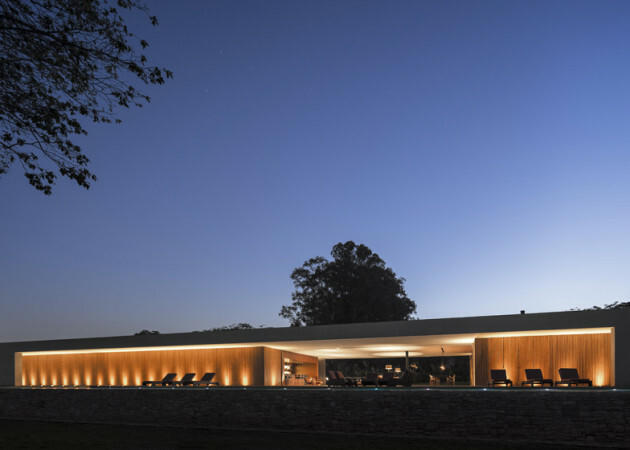 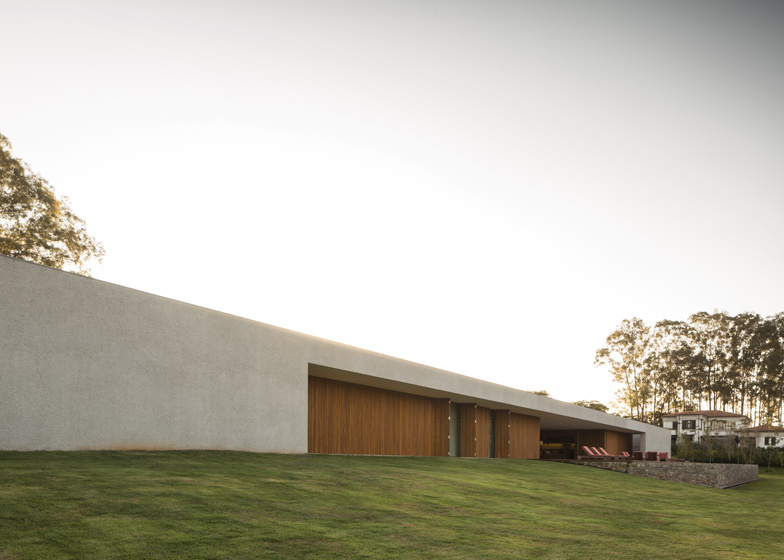 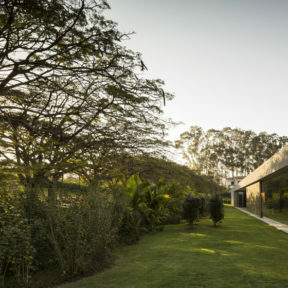 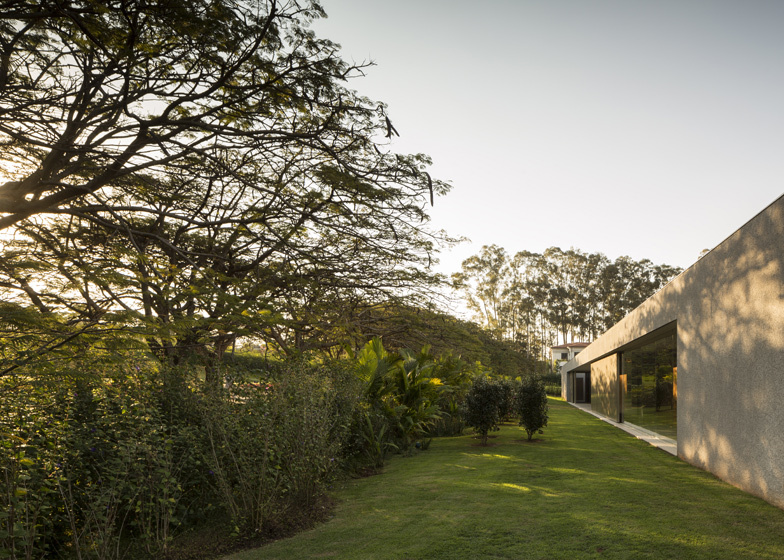 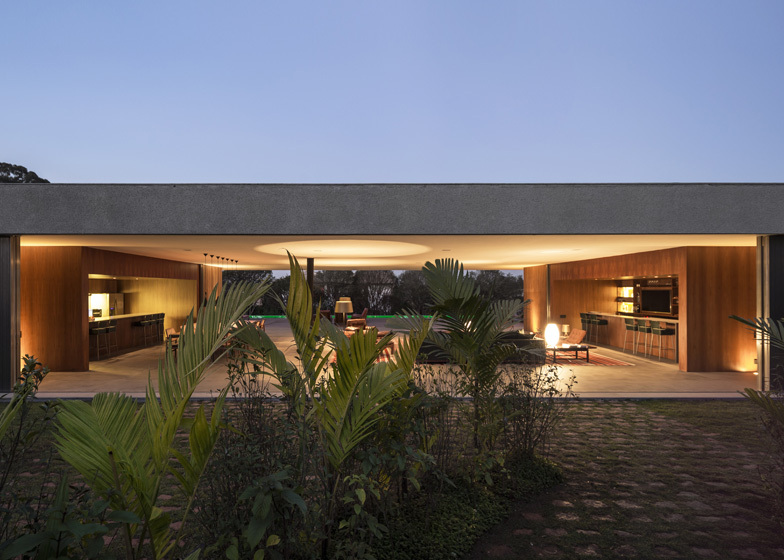 Set into the hilly landscape of the São Paulo neighbourhood of Bragança Paulista, the MM House was designed to feel warm and inviting, but also offer pockets of relief from the sweltering temperatures. 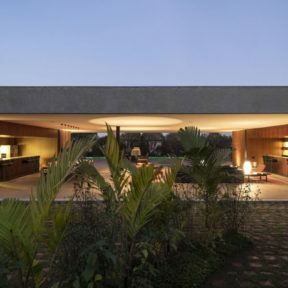 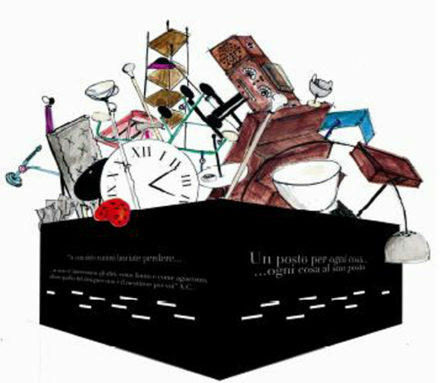 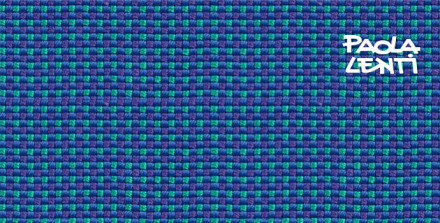 The intersection of the two volumes. 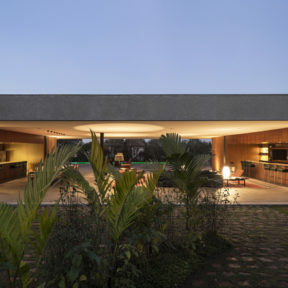 Studio MK27 erases the line between inside and out in this low-slung house in the Brazilian city, furnished with a vibrant mix of new and mid-century modern pieces.